I'm sure there will be more...I'll continue to share our mistakes (lessons learned) as they come up. We booked our flights too soon! Have you noticed that there are great deals on flights to almost everywhere right now? We booked in September.. But these ultra-cheap flight deals started to appear just after that, on tickets booked after October 1st. Perhaps this is something that happens every year and seasoned travelers would know that. Although we call ourselves seasoned travelers, it only pertains to RVing. We fly periodically but not often enough to predict the seasons for seat sales. One of our visitors while we're in Costa Rica will be my baby sister. She's flying West Jet direct from Toronto to Liberia for Can $577.00. Our dates would have been slightly more expensive but, if we had waited, we could have booked West Jet to Liberia for Can $702.00. That's $22.00 per person more than we paid but it would have cut our travel time (and cost) from the airport to our destination nearly in half. Unless we missed it, those flights weren't listed or, if they were, tickets were much more expensive back in September. These lower prices are quite incomprehensible to me since the flights are international, we paid in Canadian dollars, and our dollar has been devalued even more since we booked. Driving from San Jose to our destination (west side of Lake Arenal) takes 3 hours. From Liberia, 1 and 1/2 hours. Flying into San Jose rather than Liberia means our ground transportation cost is doubled. Through our rental agent, we booked a driver who will pick us up at the airport at a cost of $150.00. It’s a 3-hour drive and, of course, he'll have to drive both ways so, by American standards, that's more than reasonable. A local bus would have been very affordable (approx $11.00 per person) but the bus schedules are difficult to nail down, unreliable, and the route indirect so the trip would be long and slow. For sure, we'd arrive well after dark or, perhaps, need to book a hotel in San Jose our first night, negating any savings. After a long day of travel, first time in a new country, and unsure of our language skills, saving money doesn't seem nearly as important as usual! So we'll keep it simple for now. After 2 months, we hope to have experienced the buses (without luggage in tow) and may feel comfortable enough to return to San Jose "on the cheap". I got lazy and skipped a crucial step that I always recommend to my Canadian readers. Rather than shop around, I booked our extended travel insurance with the same insurer as we used on our last trip: Medipac. They're recommended by the Canadian Snowbird Association and comparing rates from several insurers is always a tedious job (since we turned 60; we have to answer a slew of health questions for each quote). Since I had done all this only a year ago, our health status hasn’t changed, and we only need to buy 31 days of insurance (the first month is covered by an annual multi-trip policy linked to our RBC Preferred Visa Card - a great deal, by the way), I figured the difference between quotes would be too small to worry about - but I was wrong. Medipac, who we used last winter, comes recommended by the Canadian Snowbird Association and, being under 65 and in good health, we could apply by filling in a short online medical questionnaire. They're willing to tack the policy onto our 31-day annual coverage plan (not all insurers will). I just went ahead and bought it. When I told Randy, he questioned the huge rate increase. A year ago, we paid $4.10 per person per day for a policy with a $99.00 deductable. It had increased to $5.74 despite no change in our health status and we haven't moved into a new age category. I reasoned that probably all companies would have similar increases, perhaps due to the devalued Canadian dollar. To appease Randy, I phoned the RBC credit card insurance to ask what it would cost to add coverage beyond the 31 days we get with the Visa card. The quote was $3.80 per day. That's $120.00 less and there's no deductable! The fine print on the policies is pretty well word-for-word, the same. But the most important part: with RBC, there's no administration fee should we decide to cancel it for any reason up to 24 hours before the start of our trip. I was soon to find out this was not the case with Medipac! Randy went to his doctor to get a prescription filled. Unless absolutely necessary, do not visit your doctor within 90 days of a trip! Now you would think that insurance companies would be happy to know you had seen your doctor recently and received a clean bill of health. Not so. Randy realized his regular prescription (for irritable bowel, a condition he's had for years) would run out and there were no repeats left without a doctor's visit. While renewing the prescription, the doctor noticed it had been a while since they'd looked at this issue, so he ordered some routine blood work and an ultrasound. A week later, Randy phoned for the results; everything was fine. Good news, right? Meanwhile, I read the small print regarding pre-existing conditions in the Medipac policy: “Any medical or physical condition, symptom, illness or disease for which medical attention was received within 90 days of the effective date of the policy. Medical attention means any medical, therapeutic or diagnostic procedure, service or supply that is prescribed, performed or recommended by a physician, including prescribed medication, investigative testing, and surgery." To me, an ultrasound (and blood work) could be considered "investigative testing". So, to be prudent we phoned Medipac who said that, because of these "tests", no matter what the results, the policy would not cover any abdominal-related health care. We then cancelled the Medipac plan and since, according to them, Randy's medical status had changed, we were able to cancel both policies without the $100.00 administration fee as long as we sent them a doctor's note or other proof that the ultrasound test had been ordered. So now, after a lot of time and effort, we think we're fully covered for any medical emergency, have saved $120.00, and learned not one but two valuable lessons: Do the homework of comparing quotes for every trip. And plan ahead so routine doctors visits occurr more than 90 days before a planned trip. Our Costa Rica Budget - How Will I Compare it with RV Travel? 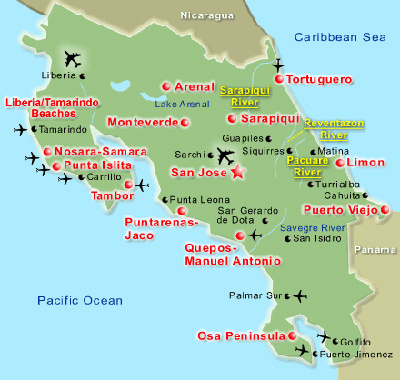 Most travel guides consider Central American countries an inexpensive destination but Costa Rica is always the exception. The cost of living is generally considered to be on par with that of The United States. Costa Rica also promises some of the most stunning scenery; a stable government and economy; good health care; and is considered safer for travelers than other Central and South American countries. For our first-time adventure of this type, we were not ready to let cost be the sole basis of our decision. Costa Rica seemed like a prudent choice. The Costa Rican currency is colones; however, we're told that dollars are accepted everywhere (usual exchange rate, approx 500 colones to a US dollar). For a comprehendible cost comparison, I’ll convert all our expenses in colones or Canadian dollars to US dollars. Since our Canadian dollar is still on a nose-dive, this also means the exchange rate won’t skew the results (or confuse my American followers). I'll compare all transportation costs: airfare, car rental, fuel, buses or taxis to our usual RV travel costs (fuel, maintenance, repairs). Those of you who travel with larger RVs than our class B may not find the difference between the two types of travel to be as great as we certainly will. I'll compare our accommodation expenses to camping fees. We boondock almost exclusively when RVing but, for those of you who pay for campgrounds, this difference may also be negligable. Other categories – food, entertainment, entrance fees, etc. will be a simpler comparison. We have no expectation of keeping expenses as low as when we travel by RV. We're just curious (and, from your letters, many of you are, too) to see just how much more expensive this type of trip will be. Of course, we aren't comparing similar experiences and we realize that the value of a completely different experience is totaly subjective and, therefore, impossible to compare. Since this is an "exploratory" trip for us, we really haven't defined a Costa Rica budget. We'll figure it out as we go but you can be sure we'll be looking for ways to save money and reporting any "mistakes" to avoid (hopefully not too many of those) on future, similar trips should we decide to introduce more of this type of travel. On a final note: Although I'll update expenses to date at the bottom of each post, the blog entries won't concentrate on costs, but on sharing our total experience of Costa Rica (hopefully, with lots of great photos). All aboard! Our Costa Rica adventure is about to begin! Hopefully, you'll tag along.